Trauma theory has become a burgeoning site of research in recent decades, often demanding interdisciplinary reflections on trauma as a phenomenon that defies disciplinary ownership. While this research has always been challenged by the temporal, affective, and corporeal dimensions of trauma itself, trauma theory now faces theoretical and methodological obstacles given its growing interdisciplinarity. 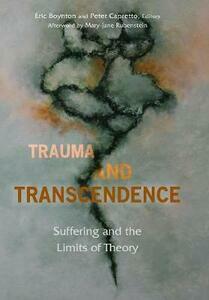 Trauma and Transcendence gathers scholars in philosophy, theology, psychoanalysis, and social theory to engage the limits and prospects of trauma's transcendence. This volume draws attention to the increasing challenge of deciding whether trauma's unassimilable quality can be wielded as a defense of traumatic experience against reductionism, or whether it succumbs to a form of obscurantism. Contributors: Eric Boynton, Peter Capretto, Tina Chanter, Vincenzo Di Nicola, Ronald Eyerman, Donna Orange, Shelly Rambo, Mary-Jane Rubenstein, Hilary Jerome Scarsella, Eric Severson, Marcia Mount Shoop, Robert D. Stolorow, George Yancy.